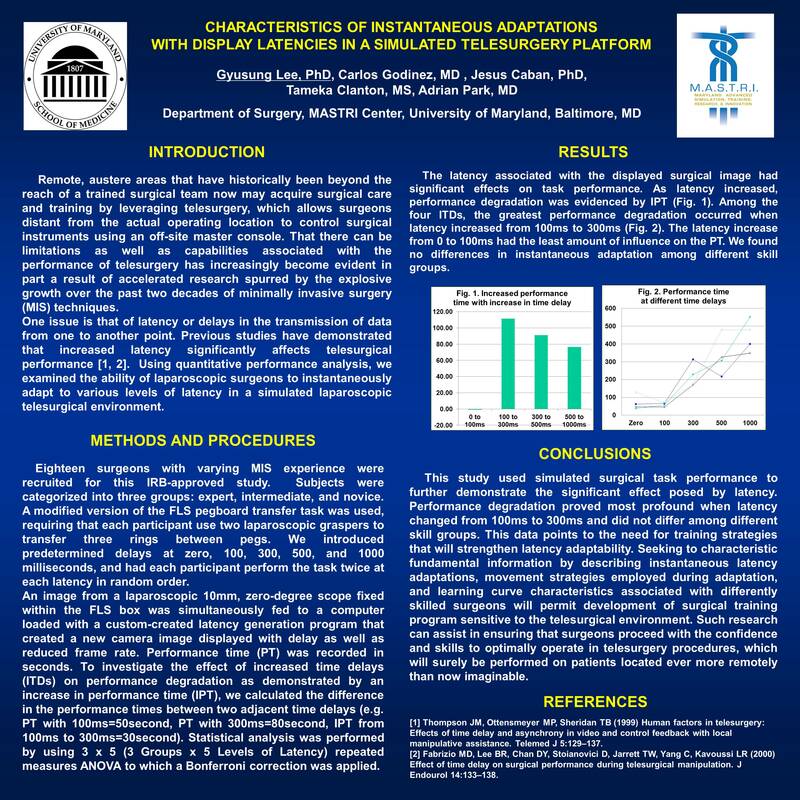 Introduction: This study investigates through quantitative performance analysis how well laparoscopic surgeons would instantaneously adapt to various levels of latency in a simulated laparoscopic telesurgical environment. Recently, advances and innovation in surgical settings have raised a number of questions about how a surgeon’s performance when telesurgery is used differs from that of the surgeon actually with the patient in the operating room. Methods and Procedures: Eighteen surgeons with varying MIS experience were recruited for this IRB-approved study. These subjects were categorized into three groups: expert, intermediate, and novice. Each participant performed FLS pegboard transfer task by using two laparoscopic graspers to transfer three rings between pegs with predetermined delays at zero, 100, 300, 500, and 1000 milliseconds. Each participant repeated the task twice at each latency in random order. The laparoscopic camera image was fed to a computer with a custom-made latency generation program that created a new camera image displayed with latency as well as reduced frame rate. Performance time (PT) was recorded in seconds. To investigate the effect of increased time delays (ITDs) on the performance degradation shown with increase in performance time (IPT), the difference in the performance times between two adjacent time delays was calculated (e.g. PT with 100ms=50second, PT with 300ms=80second, IPT from 100ms to 300ms=30second). Statistical analysis was performed by using 3 x 5 (3 Group x 5 levels of Latency) ANOVA with repeated measure design with Bonferroni correction. Results: The latency effect of the displayed surgical image had significant effects on task performance. As the latency increased, performance degradation demonstrated as longer performance time. Among the four ITDs, the biggest performance degradation was observed when the latency was increased from 100ms to 300ms. Latency increase from 0 to 100ms had the least amount of influence on the PT. Interestingly, we found no positive or negative differences regarding instantaneous adaptation (performance of task without previous latency training) among different skill groups. Conclusions: This study demonstrated that the effect of latency on a simulated surgical task performance was significant. The performance degradation was more profound when the latency changed from 100 to 300ms, though instantaneous adaptation did not differ among the skill groups. This data points to the need for development of training strategies for strengthening latency adaptability so that surgeons will be equipped to optimally operate with the increased latency required by the ever more remote telesurgery procedures that will surely be performed on patients located ever more remotely than now imaginable.